Bramante's Milanese differs so much from his Roman work that it has been ascribed to a fictitious "Bramante of Milan." a. a fully developed and articulated metaphor of the machine-universe. c. a formless heap of fragments colliding one against another. d. a formless tangle of spurious organism. e. a homogeneous magnetic field jammed with objects having nothing to do with each other. f. a kind of typological negation. g. an "architectural banquet of nausea." h. a semantic void created by an excess of visual noise. j. a typological sample book. "And thus the cause of the "decline and fall" is one alone--the loss of republican freedoms and the advent of a laxist aristocracy. The Piranesian "labyrinth" begins to give itself a political significance, cleverly disguised. The ambiguity of the Campo Marzio now becomes evident; it is at once a "project" and a denunciation. As a disenchanted documentation of the impossibility of an unambiguous definition of language, it--projecting this situation into the past--sounds like a merciless satire of the infinite capacity of late-baroque typology to reproduce itself metamorphically. (The fact that in the Campo Marzio the allusion to baroque typologies is filtered through a classicist geometrism fools no one; it is simply a means of rendering metahistorical and universal the polemic already begun.) Inasmuch as it is--despite everything--an affirmation of a world of forms, the Campo Marzio, precisely because of the absurdity of its horror vacui, becomes a demand for language, a paradoxical revelation of its absence. Negation and affirmation cannot split apart. The "naïve dialectic" of the Enlightenment is already superseded. The "great absentee" from the Campo Marzio, then, is language. The absolute disintegration of formal order, of what remained of the huminist Stimmung, of its sacred and symbolic values--and, above all, of perspective as a symbolic instrument for the quantitative control of space--logically also affects the subject of Piranesi's work: the relationship between history and the present. On one side, there is painstaking , scientific study of archeological findings; on the other, the most absolute arbitrariness in their resolution. (In this respect, after all, the Campo Marzio is anything but an exception in Piranesi's work.) History no longer offers values as such. Subjected to a merciless inspection, it is revealed as a new principle of authority, which as such must be disputed. It is the experience of the subject that establishes values; in this, already lies all the aspiration to the negative polemic of romanticism. 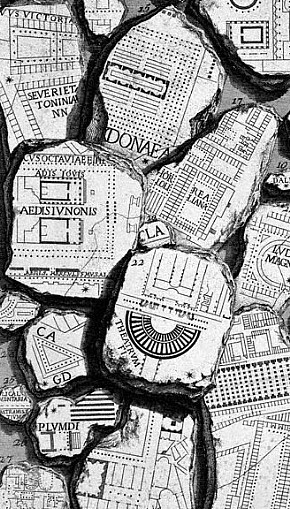 Is Piranesi the "archeologist" interested in caves, underground passages, and substructures purely by chance, then? Rather, cannot this interest in "what is hidden" in ancient architecture be interpreted as a metaphor for the search for a place in which the exploration of the "roots" of the monuments meets with the exploration of the depths of the subject? Manfredo Tafuri, The Sphere and the Labyrinth - Avant-Gardes and Architecture from Piranesi to the 1970s (Cambridge: The MIT Press, 1987), p. 38. ...a prime example of the proverbial "two sides to every story." My favorite: The configuration enters another one is connected with the both. Generally, Bloomer's treatment of Piranesi's Campo Marzio follows that of Tafuri's, but she investigates some of Piranesi's other work with some originality. She is much better at finding symbolism/hidden meaning in Joyce, however, than she is in finding the same in Piranesi. For her, the (s)crypt(s) signifies a labyrinth (one she often seems lost in herself, even though it is a labyrinth of her own making!). For example, she sees the Campo Marzio plan as representing the labyrinth of the underworld, that place where the [Cartesian] grid/cage of rationality does not apply. Her [s]cryptic efforts getting into this underworld are especially worth reading because it is a thorough aggregate of good research mixed (unfortunately?) with the Tafurian and Derridian agendas (see her treatment of the CM's Terentus occulens aram Ditis et Proserpinae). Inadvertently, however, by going 'underneath' the large plan, she puts all her effort into seeking something that is not there. Essentially, she avoids the real plan itself. Can anything other than light travel at the speed of light? Would those electric waves of radiation and those magnetic waves of radiation that compose light be light at any other speed? Doesn't being at the speed of light pretty much make everything else incidental? How does the speed of brain synapses compare to the speed of light? As to electromagnetic (radiation) architecture, i.e., architecture of light, the two best examples currently on this planet are the Pantheon in Rome and Kahn's Kimbell Art Museum. Chronosomatics suggests that the foremost electromagnetic architecture coincides with osmotic architecture--the heart being the body's center of electromagnetism and the lungs, which surround the heart, are the body's largest concentration of osmosis. The heart enters the plane of the present c. 3090. the kidneys are the body's second largest concentration of osmosis, but in the kidneys, osmosis mixes with metabolism. ...the flow/current/wave pattern of your emitted thoughts carry good highs and lows, provoking aboves and belows, and, this time at least, a co[s]mic ending[?]. ...you continually apply the standards of the real world to the virtual world with what appears to be a non-investigation of those [other] qualities or standards the virtual [so far] evokes wholly on its own. My leaning toward virtual extremism is at the same time a search for some "purism" within the virtual. I don't want the virtual to merely become a reflection of the real, and that is precisely because it seems that we are actually lucky enough to be living at a time when the whole notion of a virtual realm is becoming a viable other realm--a wonderful time when it is truly possible to begin delivering something that is above all NOT more of the same [o. s.]. For what it's worth, what John just said, "Which is why some argue that reason is too slow to be useful any more. Intuition and insight are speedier, but not as fast as illogic and madness." describes perfectly my position regarding design, and even more so art. Moreover, I began to think this way back in 1983, within the first month of my working as a computer-aided architect eight hour a day, five days a week. I never expected it, but I rather quickly saw that cad (and here I must mention that I was using Intergraph, which was phenomenally superb even by most of today's standards) would be incredibly fast if the user/designer too was incredibly fast, however, the speed of the designer coming close to the speed of the computer meant a shift into spontaneous mode, a design mode rarely taught, and indeed most often severely denounced.